Cleaners can cost a fortune these days. If you’re anything like me, you’d probably much rather spend your small budget on other things besides…cleaners! I’ve been through several stages in my life when it comes to keeping a clean house on a small budget. We’ve always had a small budget to work with. It’s been a challenge to buy everything we need to run a household without going over the monthly budget. There was a time when I was obsessed with making my own cleaners. I still do occasionally. I’ve had other times in my life where I was obsessed with using coupons and stalking the sales so I could get them for free. Both took time and effort. Half the time I made my own, they didn’t work like I hoped they would or made my house smell like a jar of pickles. After halving a c-section with my 4th child, my time became much more precious and I became obsessed with simplifying more than saving money. Cleaning concentrates cost pennies compared to buying pre-made cleaners and create less waste. My home smells great, it’s clean, I always have cleaners on hand because my concentrates last forever, and I don’t have to worry about whether or not my latest “concoction” will do what I want. There are lots of great concentrates out there and you may find your favorites are different than mine, but I will share them anyway. The cheapest unscented concentrate I have found is Bio Kleen’s All Purpose Cleaner. This stuff lasts FOREVER! For a sweet natural fragrance, I love Mrs Meyers concentrates. I’ve only tried the lemon verbena scent but the other scents have great reviews too. I’m still using the 32 ounce bottle I bought almost a year ago and it has a lot left in it! I also invested a small chunk of change in E-cloths 3 years ago and they are still working as good as the day I bought them. They are a much less expensive version of Norwex and much cheaper than using paper towels! What are your favorite cleaning concentrates? 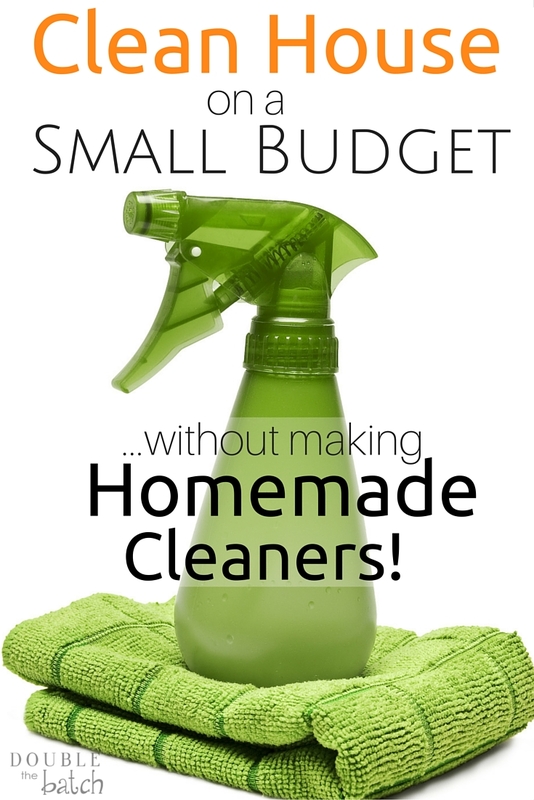 Have you found another way to keep a clean house on a small budget? Please share!